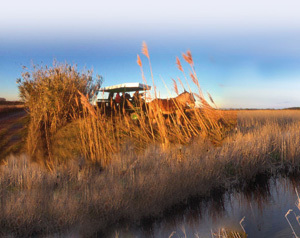 The « Marais du Vigueirat » offers a total immersion in the heart of the wild Camargue to the rhythm of the hooves of draft horses. Over the seasons, two carriage tours invite you to discover authentic landscapes and in perpetual motion (comments only in French). Installed on the carriage, respect and discretion are best assets to share the intimacy of wildlife that occupies the site. Pulled by draft horses, the carriage follows a path traced on dykes of old fish farms and overlooks the marsh, at the heart of the National Nature Reserve. Besides the diversity of characteristic species : ducks, geese, herons, flamingos, storks, waders and other wading birds, you can also watch the the herds of Camargue horses and bulls grazing on the field. Coypu, wild boars, foxes do not hesitate to make an appearance. 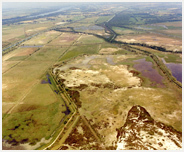 In order to respect the perdiod of resting and breeding of different species, the visit takes place in the higlands of the site (not flooded). Crossing of high grazing fields of Camargue horses and bulls on the estate. You will discover how this very hardy breed and farming method so special could cross the centuries to become today one of the most important assets of the Rhône delta. Several couples of sedentary white storks also occupy the site and are particularly visible in the spring, hunting in the field. 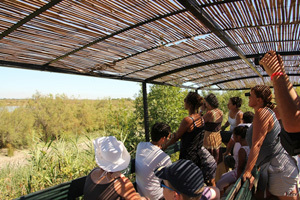 For children’s group : one gratuity for a guide and/or teacher granted for 10 paying chilren. Additional accompanying adult €12 .